By Travis - Egypt - 09 Nov/03 - Viewed 1643 times. Our ferry across the Gulf of Suez from the tip of the Sinai Peninsula to the resort town of Hurghada did not leave until 6:30 in the evening, so we spent our last day in Sharm lazing around on the beach, under the shade of a thatched-roof hut. Abi caught up on her journal, and I knocked out a few chapters of a book I had been plodding through since we left the US. It was late when we arrived in Hurghada, and the hotel we had decided upon based upon the Lonely Planet recommendation ended up being a pit. We stayed there anyway, as we were leaving first thing in the morning and it was close to the bus station. The next day was a hot and excruciating long busride to Aswan. The one highlight (other than sweating off a few pounds) came once the sun went down, the bus pulled over to a tent area alongside the road, and we all piled out for the Egyptians to break their Ramadan fast. We were invited to join them, and they were very generous with food (rice, lima beans and a little meat) and drinks (cold tea, pear juice, and hot tea at the end) and offered us a turn on the shisha (hubble bubble pipe) and cigarettes, which we politely declined. We arrived in Aswan, checked out a few hotels before settling on the Al-Salaam (much cleaner and nicer than the Hurghada hotel, for the same price). The next morning we hired a cab to take us to some of the area sights--Kalabsha Temple, Philae Temple and Aswan's High Dam. The first two had to be disassembled and relocated to higher ground (both on islands) as a result of Lake Nassar being created behind the High Dam. We took motorboats out to each of the islands, where there was a main temple and some smaller buildings and pillars scattered about. Having read that Lake Nassar is the world's largest manmade lake, I was surprised by the High Dam being so low (probably less than one hundred feet) and made out of gravel and stone, since I'm used to the large dams in the States being located in steep valleys and made of concrete. We were back in Aswan In the afternoon, and took a ferry halfway across the Nile to Elephantine Island. This place was very sketchy, stinky and dirty, except for the archaeological site we visited, which was merely uninspiring. We took a rowboat a little bit further across the Nile to Kitchener's Island to see the gardens that Lonely Planet raved about...another let down. 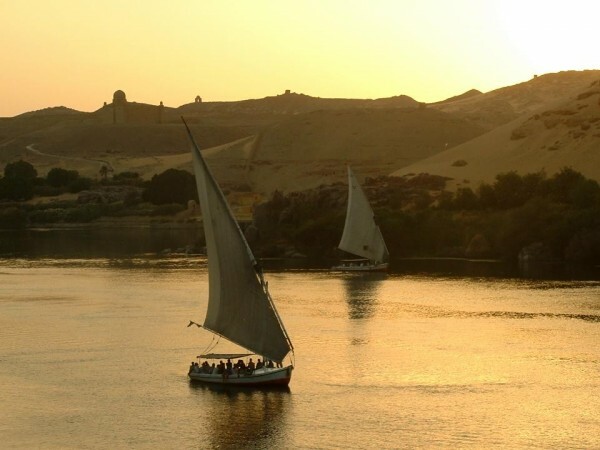 We did catch a nice sunset there and watched the felucca boats sailing up and down the Nile. We had hoped to be able to ride back to Aswan directly in one of the feluccas docked on Kitchener's Island, but they were only for tour groups (they wouldn't let us tag along and pay separately), so we had to find a dingy back to Elephantine Island, walk through its trash-strewn streets to the opposite side of the island and take the ferry back to the Aswan bank. That night we arranged transportation to Abu Simbel, a pair of temples built at the behest of Ramses II on the southern border of his empire (now near Egypt's border with Sudan). To beat the heat, all the buses and minibuses leave Aswan at 4:00 AM to travel the three hours through the desert along Lake Nassar in a convoy. Therefore, we arrived with all of the 2000 other people that were visiting that day. Despite the crowd, Abu Simbel was incredible in both its size, artistry and for the fact that it was another site that was completely dismantled and moved to higher ground to escape a watery burial under Lake Nasser. The Valley of the Kings looks like a series of chat piles, with entrances to the pharaohs' tombs every twenty meters or so. We were asked at the entrance to the site whether we had a video camera (we didn't), but missed the one sign at the gate that said no photos inside the tomb. Abi took a photo of a mural in the tomb of Ramses III (no flash), and an older Egyptian man, with no appearance of any official status, came toward us wagging his finger. "Oh, no photos, okay, no problem...sorry", and Abi starts to put the camera away, but not before the man grabs the strap around her neck. He makes a series of gestures that he's going to take us outside to report us, that he wants a bribe and/or he's taking the camera. Knowing that he has no enforcement responsibilities and that he just wants some money (the guidebook alerted us to this scam), I step between him and Abi and try to get his hand loose from the strap. He redoubled his efforts, and Abi was getting spooked, so I gave his hand a good wrenching while yelling for the police and he relented. A couple minutes later a security guard (automatic weapon in hand) comes to see what the problem was, and ends up appologizing for the hassle (but leaving the other "guard" in the tomb to extort a little tribute from other wayward photographers). That was it for Luxor (other than a camel ride to unwind--soooo relaxing!). We took a train to Cairo the next morning, and got our flight to South Africa moved to the following night. We spent today at a second hand book market, and trying to find materials to use to repair one of my Tevas.